On the farm, vegetable growers face the same threat from foliar blights every year. Potato and vegetable growers in Wisconsin have worked closely with University of Wisconsin researchers for decades, to understand the science behind that makes these blights tick. Through research, we have developed and implemented innovative disease management strategies to both avoid and combat plant disease problems. What farmers are managing and attempting to control through our pest management programs is a very persistent fungus. Growers start by ensuring that all seed is clean and disease-free to prevent the introduction and spread of the fungus onto their farm and into their fields. The first step is often to reduce the threat of infection. Blights are caused by the fungal spores and most can survive over winter in soil on decaying vegetation. Growers take great care to rotate their crops away from the previous year’s crops, planting them in disease-free areas. By practicing crop rotation we avoid the threat of early season infection from overwintered spores. We are also careful to avoid moving fungal spores from field to field by washing and sanitizing equipment when moving between fields. Farmers also reduce the risk of losses by using disease resistant varieties. Our plant breeders select varieties with the ability to resist various diseases whenever possible (seed catalogs often include disease resistance in their descriptions of varieties). Despite farmer’s best efforts, nature has a way to combat our disease-free management plans and efforts. We know that sooner or later, with the right conditions, spores will be carried on the winds to susceptible vegetables and disease control will be needed. Early detection of the spores helps keep the controls to a minimum without sacrificing crop yields. Farmers achieve this by knowing everything possible about the specific fungal spores through research and science. Crops are carefully inspected every week. Growers are now on the verge of using cutting edge DNA assays to identify individual spores before they can even begin to infect plants! Researchers can assess the precise needs of the foliar blight spore for water and temperature and then develop sophisticated prediction models that allow growers to deploy precise control measures. By WI state law, growers, homeowners and/or garden centers are required to properly dispose of any signs and sources of late blight before the start of each growing season. Any and all left over potatoes, not destined to market are destroyed every year by April 15th.. Growers use a sophisticated weather and disease forecasting model that indicates when growers should begin applying crop protectant materials to limit late blight from developing in fields. This forecasting model (Blight cast,) calculates disease severity values, which accumulate when conditions are right for disease development, usually during high temperatures, high humidity and rain. Late blight can cause devastation to crops and home gardens across the state. Growers will proactively destroy large portions of fields if late blight is found. This is the only effective way to stop the disease from spreading as the fungus survives only on living tissue of a host plant. The disease spreads easily and losses will be even greater if left uncontrolled. Growers are also concerned about spreading the disease spores as they move from field to field. To mitigate this, farmers routinely sanitize all equipment, even their boots, before entering fields to avoid spreading the fungal spores. Late blight is a community disease. Growers actively discuss blight occurrences throughout the region. UW-Madison Plant Pathologist Amanda Gevens sends out state-wide updates on when to expect problems (based on conditions reliant on modeling). Research alerts, reports and updates are communicated to growers regarding locations the disease has been documented and the severity of the outbreak. She actively discusses late blight concerns with local media to ensure that the general public is aware of the potentially devastating effects of this serious disease. Like farmers, gardeners are encouraged to destroy garden areas immediately if infection is found. This action prevents the spread and protects other homeowners as well as local farmers from this disease. In recent years, one source of the late blight fungus is tomato plants sold in local garden centers and farmers markets. It is critical that the public is aware of late blight and the associated risks. We must realize that this is a community-wide problem, which requires everyone who grows plants that can host late blight to be watchful and ready to act! Our food security is too important to be placed at risk by failing to act quickly. 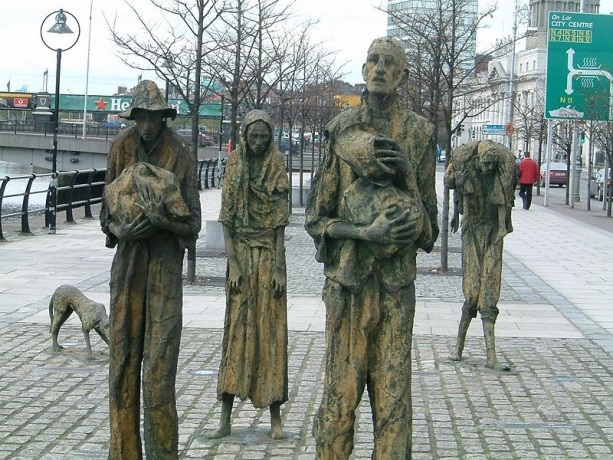 The Irish had little knowledge of what the disease was in the 1800s and no weapons to fight it and the resulting famine had tragic global consequences. The disease is still with us and science has now provided us with the tools to fight it and it is essential that everyone in the community work to prevent the infestation and its spread. Because of proper pest control programs, consumers have access to reliable, nutritious foods at affordable prices while the environment benefits with fewer but more effective controls being used. Battling foliar blights is an ever-evolving process that requires continued investment by growers and researchers. The security of our food supply in key production areas such as Wisconsin’s Central Sands is a valuable a resource and we need to work together to manage our risks.